Although, college experiments weren’t her introduction to the power of herbal remedies. She already had the notion to recreate store-bought products in a safer, more cost-effective way. “When I was a teenager, I started getting into natural foods, and I had a heightened awareness of all the additives and low-quality ingredients in my food and beauty products because I suffer from debilitating migraines.” But herbal infusion proved time-consuming, and Bellman wondered why there wasn’t a machine that made the process as easy as it is to make coffee. And that’s how LEVO, a Keurig-esque device for infusing oils with herbs such as (but not limited to) marijuana, was born. LEVO launched the presale for what is now their classic device in September 2016. At the time, Bellman teamed up with Olivia Harris, who had been freelancing for four years prior to their meeting, helping companies develop their brand identities, including logos and marketing collateral. Harris was forwarded the LEVO marketing deck by a friend who suggested she give Bellman some free advice. When she opened the deck, she saw something special in the device and decided to begin working with her to build a company. Now, more than two years later, the pair has been joined by two more full-time employees and an “army of part-time and freelancers who make it all happen,” Harris says. In the five years Bellman spent making plans and prototypes for the LEVO classic, cannabis infusions were not the only thing she had in mind. “I was inclusive of cannabis from the beginning, but at that moment—and still today—the crux of our vision is that we are just as inclusive of cannabis as we are every other herb, and we hope that helps the normalization of it all.” Her finance mindset, and some wary NYU professors, also played a role in how LEVO kitchen appliances were to be marketed, knowing that, from a feasibility standpoint, having non-cannabis uses would elevate the brand and distribution while still moving the needle to make cannabis more mainstream. The company now offers two products—the classic LEVO and the LEVO 2, the latter of which was designed based on customer feedback. 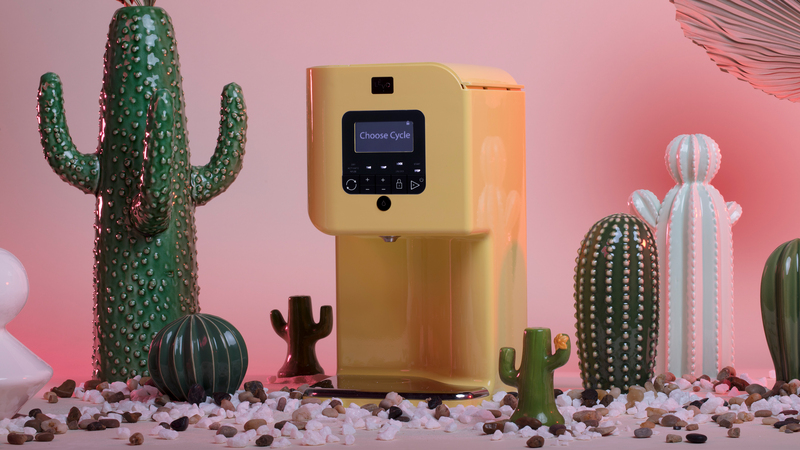 Slight changes were made to the reservoir, slanting it to minimize waste, as well as settings that allow the user to dry and activate herbs prior to infusion, plus WiFi connectivity, so users can monitor their infusions remotely. While Bellman and Harris want customers to explore their more playful sides and create infusions specific to their interests, they do include with every purchase recipes for infused vinaigrette, butter, and coconut oil. They’ve also developed an app with a calculator, so one can determine the percentage of THC in every tablespoon and cup of their cannabis oils; the app is also where users can share their recipes with one another. As for their own tried and true LEVO-apropos recipes, Bellman mixes up a variety of scrubs using an infused oil, an acid (usually fresh juice from a lemon or orange), and salt or sugar. Harris’s year-round recipe is a Tofutti cheesecake that she tweaks based on the season. For the crust, she mixes graham crackers with an infused butter or ghee. Keeping the cannabis infusion only in the crust makes it so people don’t accidentally dose themselves; she follows the same rule when making sauces or dressings. “I try to make infusions where if [a dish] doeshave cannabis, someone has the option to partake or not,” Harris says. The way Harris goes about creating her infusions is a brand statement as a whole. Their goal has been the same from the beginning: to create a product that is accessible and broad in its use. They’ve never wished to target one specific demographic or market; instead, they’ve created something that hopefully everyone can enjoy.